Free downloadable party invitations, each themed to match your party! Whether your party is Frozen, cowboy, princess or superhero themed we have a Free Printable Birthday Party Invitation invite to match! You’ve set the date, got the food and the entertainment organised, but how will anyone know about your kid’s party? If this is you, you need kids’ party invitations now! Superheroes Inc. has everything that you need to be ready for the big day. With our free printable party invitations, letting your child’s friends know when the party’s on is just too easy. Our free birthday party invitation templates also make it easy for you to customise important information, like whose special day it is, the time, venue etc. You can invite as many kids as you want and it’s super quick and easy. Print, download or send your kid’s party invitations with a click of a button. Wait… there’s more. The best part about our invitations is that they match the theme of your party. Whether your child is having a princess party or a pirate party, we’ve got the designs to tie-in your child’s favourite characters. Who wouldn’t want to receive a superhero-themed invitation? To make your child’s birthday truly special and stress free, use our printable kids’ party invitations. Get them here – it’s FREE! Aten-Hut! Get your troops into formation with these Free Army Commando Themed Party Invites! You’ll be the Belle of the Ball with these lovely Free Princess Themed Party Invites! We’re all over it but the Frozen juggernaut rolls on for the little ones! Let’s make your party a bit easier with Free Frozen Themed Party Invites! The only way these Free Fairy Themed Party Invites could be cuter is if they came covered in glitter! Caution, these Free Mermaid Themed Party Invites are NOT waterproof! Dance, dance, dance the night away with Free Dance and Music Themed Party Invites! Get all your cowboys and cowgirls to saddle up their steeds with these Free Western Cowboy Themed Party Invites! Make some extra fun for the parents; cut these Free Ninja Themed Party Invites with a karate chop! 1001, 1002, 1003. Oh, I didn’t see you there. I was too busy crunching weights! 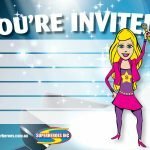 Come join me my Superhero crew with these Free Superhero Themed Party Invites! Aaargrgghh me hearties, download these Free Pirate Themed Party Invites or i’ll chop your legs off!!! Call a super secret spy meeting with these Free Spy Themed Party Invites! Kick a goal, score a try; whatever your sport is, you’ll be a winner with these Free Sports Themed Party Invites! Fight crime and save the day with these Free Superhero Themed Party Invites! Start your own little neighborhood posse with these Free Superhero Themed Party Invites! Watch out soldier! Sure you can Floss but do you have what it takes to download this Free FORTNITE Themed Party Invitation! Watch out Decepticons! 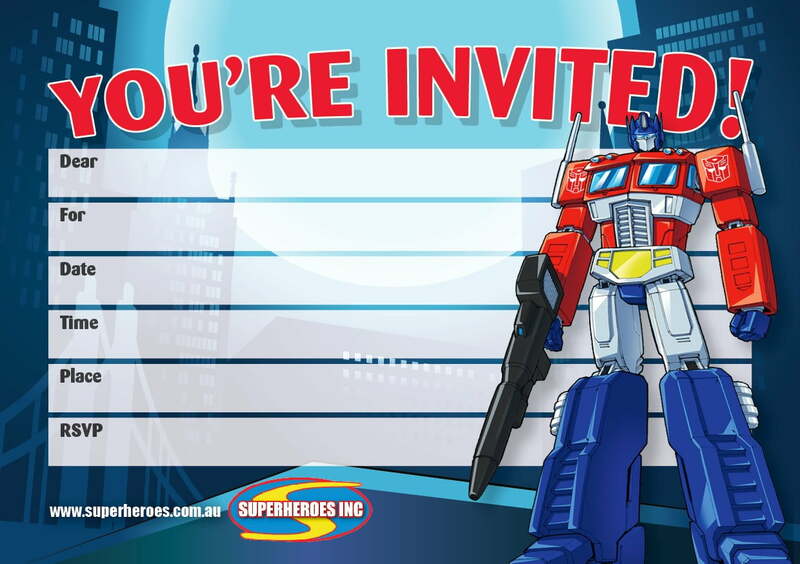 Optimus Prime and co are on their way to your house with these Free Transformers Themed Party Invites! May the force of these Free Star Wars Themed Party Invites be with you!